Exploring historic food trails, tastes and traditions that past with present in Amsterdam's historic center. Since spring 2013, CITIES Foundation, in the framework of the project FARMING THE CITY, organizes the Old Amsterdam Food Tour. Walking through the old city center, we bring history back to life with stories, tasting experiences, tailored workshops, or just food talks. 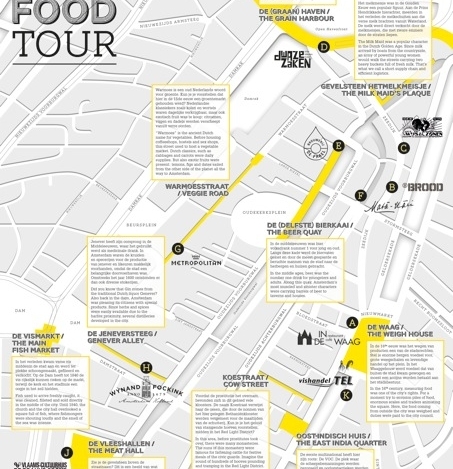 Starting April 2014, an all-new Old Amsterdam Food Tour map will be circulating the city. We present a full-page map highlighting 10 local entrepreneurs partnering with the tour and bits of historical information in both Dutch and English (map featured below). Along with the map, there is a bounty of information linking past to present and tantalizing your taste buds. We are excited to take the Old Food Tour to a new level – more below! This article's feature image of the map is just a taste of what you can expect from this year’s Old Amsterdam Food tour: Book a tour to explore more! Write to FOODTOUR@FARMINGTHECITY.NET to book your Old Amsterdam Food Tour to discover Amsterdam from a new perspective. From 2 to 20 people, we are able to accommodate anyone’s needs including workshops, lectures and food activities. The tour can be tailored for children, couples, adults, foodies, co-workers, tourists and just curious urban explorers.